That's a lot of chocolate!! The following is a recipe that we've made twice. I have to warn you that small children (I won't name any names) who really like to eat chocolate cake, might eat a whole big piece of this--so watch out who you make it for. That said, it's a dreamy cake with a variety of chocolate flavors and textures and the mint adds a special fun quality. From A Suite of Sweets: a collection of delectable dessert recipes, by Janice Gockel. 1. Place chocolate in medium bowl. Heat cream and corn syrup in small pan until nearly boiling. Pour hot mixture over chocolate; add extract and let stand 1 minute. Whisk until smooth. 1. Preheat oven to 350° F. Butter one 9-inch diameter cake pan. Line bottom with buttered parchment paper. Dust with flour. 2. Mix first 5 ingredients in medium bowl. 3. Using electric mixer, beat butter in large bowl until light and fluffy. Gradually beat in both sugars, then vanilla. Add eggs one at a time, beating well after each addition. Beat in dry ingredients alternately with buttermilk in 2 additions each. Mix in chocolate chips. 4. Transfer batter to prepared pan. Bake cake until tester comes out clean, about 1 hour 5 minutes. Place the cake, in its pan, on rack for 5 minutes. Turn cake onto rack. Cool. 1. Stir chocolate, butter and corn syrup in heavy pan over low heat until melted and smooth. Mix in extract. Cool until lukewarm but pourable, about 20 minutes. 1. Pour 1/2 cup of the glaze over the center of the cake. Spread that over the top and sides of the cake. Chill until glaze sets. Pour remaining glaze over center of cake, then spread quickly over top and side. Chill again until glaze sets. 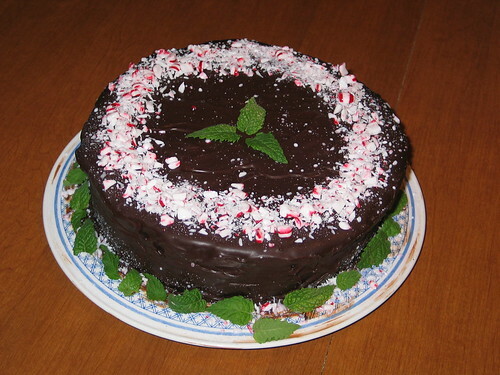 Sprinkle candies around top edge of cake, then garnish with fresh mint leaves. 2 comments on "Triple-Chocolate Chocolate Mint Cake"